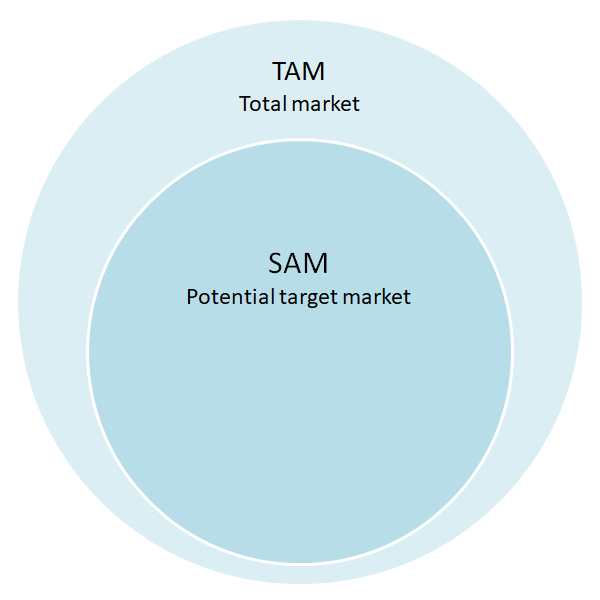 The target market is the served available market (SAM) which your business aims to target and has the resources to reach and service within the next few years. Your product will not be of equal interest to all potential customers, as they do not all have the same needs and characteristics. This section of the business plan deals with the analysis of the target market into different groups of customers (customer or target market segments) each having distinct characteristics and needs from the product. The reason for customer segmentation is to allow a different marketing plan be identified for each customer segment, dealing with questions such as distribution channels, marketing activities, product usp, and price. The target market segmentation strategy depends on the business and the product, but generally segmentation falls into the following customer characteristics groups. Psychographic segmentation splits up a sales market of a business based on such things as the social class, lifestyle choices, personality traits, tastes, attitudes, and the opinions of its customers. Psychographic market segmentation examples include the promotion of products such as cars as these often reflect a customers lifestyle, and leisure activities. For example, a car business might identify customers who are interested in keeping the environment green and promote hybrid cars to them, or a business involved in activity holidays will seek to market to customers who show a preference for an active lifestyle. Geographic segmentation is the process of splitting up a sales market of a business based on the geographical location of the customers. It is a particularly important marketing tool when the business is a multinational, worldwide business, but is also used by businesses to split their markets into region, county, state, city, neighborhood, or postal code. A geographic segmentation example would be seasonal clothing items such as coats and swimwear. In contrast, in a colder climate coats would be marketed and sold all year round whereas swimwear would be highly seasonal during the holiday period. In a hot climate swimwear would be the all year round product and winter coats might not be sold at all. Behavioral segmentation is the process of splitting up the sales market based on brand loyalty, usage, benefits required. The business plan target market section can be presented in a number of formats, but a listing of the major customer segments together with a pie chart will show the investor where the main potential for the product lies. In the example below, the market is split into four main segments both in terms of number of customers and percentage of the total target market. The average customer spend is also included, to reconcile the total target market back to the served available market (SAM) in monetary terms. Finally, a brief statement about the growth prospects for the market is included to show the investor the potential for growth in your chosen customer segments. When identifying the target-market segments, it is important to be as specific as possible about the customer characteristics which make up each segment. In choosing which segments to concentrate on, take into account the size and potential for growth of each segment, and identify clearly what benefits, both emotional and financial, the product provides for the customer. This is part of the financial projections and Contents of a Business Plan Guide, a series of posts on what each section of a simple business plan should include. The next post in this series is about the analysis of the competition for the target-market.